ClimaLoop supports and plays an active role in promoting sustainable, economical, and technical solutions to assist sustainable development. Climaloop has grown its expertise in the utilization of the Clean Development Mechanism (CDM) as a tool to help the link between local sustainable development and the reduction of greenhouse gas emissions. The CDM allows emission-reduction projects in developing countries to earn certified emission reduction (CER) credits, each equivalent to one tonne of CO2. These CERs can be traded and sold, and used by industrialized countries to a meet a part of their emission reduction targets under the Kyoto Protocol or future climate change agreements. ClimaLoop covers and leads the entire process to register the Clean Development Mechanism (CDM) project under the UNFCCC; conducting the necessary pre-feasibility studies for the preparation of a high quality PDD and paying special attention to the DOE and EB management to successfully register the project in a timely manner. ClimaLoop considers the Project Design Document (PDD) as the key document involved in the validation and registration of a Clean Development Mechanism (CDM) project activity. With the experience and the high technical skills of our team, ClimaLoop approaches our clients with the necessary complete coverage at the design stage to prepare a robust Monitoring Plan (contained in the PDD) which can generate verifiable emission reductions during the future Post-Registration phase. Moreover, since additionality is a principal condition for the eligibility of a project under the CDM, ClimaLoop will prepare a realistic and validable economic feasibility assessment to demonstrate additionality and avoid any possible registration risk. 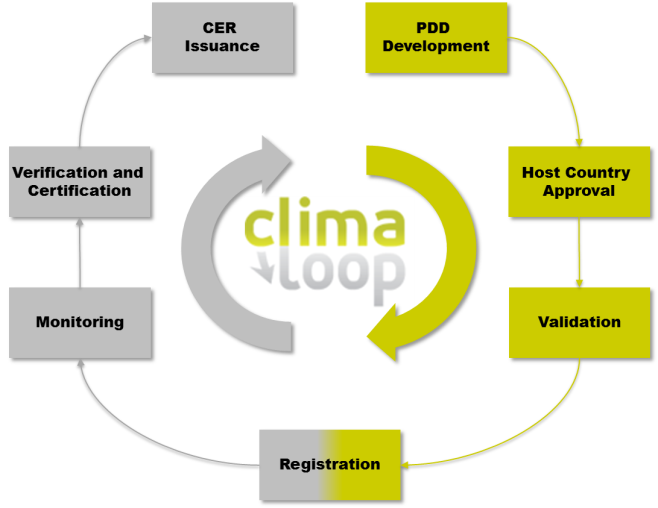 Moreover, since the PDD would need to be reviewed by the DOE during the validation process to ensure that the intended project meets the requirements set by the UNFCCC, ClimaLoop will lead and attend the validation visit with the aim of mitigate any non-compliance which can delay the registration process. The DOE management in the registration stage has been considered to be a key component in our successful registration experiences. ClimaLoop is proactive in managing the DOE by facilitating its job with the following premise: the better the validators do their job, the fewer the requests for review by the Executive Board and the CDM registration of the project activity can be achieved earlier. Download the brochure of the CDM Pre-Registration Services. ClimaLoop provides support to Clean Development Mechanism (CDM) projects which have already been registered for the issuance of CERs; starting by the preparation of an accurate and verifiable Monitoring Report in accordance with the PDD, and including the DOE and EB management to punctually certify the GHG reduced by the project. ClimaLoop will pay special attention to the Monitoring Report (MR), which is the key document involved in the verification and issuance of the Certified Emissions Reductions (CERs) of a Clean Development Mechanism (CDM) project activity. Considering the high technical skills of our team, ClimaLoop can provide with the right technical approach at the operational stage to monitor the GHG emissions in accordance with the registered Project Design Document (PDD) from the Pre-Registration phase. Moreover, since the calculation of the GHG emissions reduced is a principal condition for the verification and issuance of CERs, ClimaLoop will prepare a realistic and verifiable spreadsheet in accordance with the applicable CDM methodology. Additionally, the Monitoring Report would need to be reviewed by the DOE during the verification process to ensure that a project meets the requirements set by the UNFCCC. Previous to this step, ClimaLoop will firstly provide the necessary training to the client´s personnel and accommodate the internal procedures of the project to ensure compliance with the CDM and the registered PDD. This previous step is recommended to properly organize the verification visit to avoid any non-compliance. ClimaLoop manages the verifying DOE by facilitating its auditing task so the CERs issuance can be achieved earlier, leading to the corresponding revenues which ensure the profitability of the CDM project activity. Download the brochure of the CDM Post-Registration Services.